VertaseFLI was contracted by Williams Automobiles to construct a new showroom for the sale of automobiles. VertaseFLI worked in conjunction with architect robin Melvin & associates and engineer Clarke Matthews. The scope of the extension was to include all earthworks, groundworks, foundations, external works, frame construction, cladding and internal finishes. 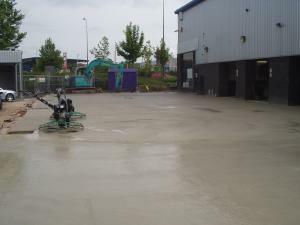 The project commenced with the removal of existing tarmac and obstructions across the footprint of the building and site clearance before a specialist sub-contractor undertook Vibropiling to the footprint of the building. 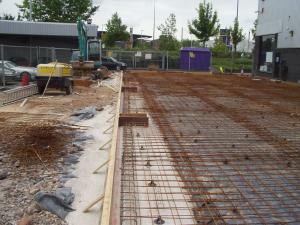 Existing drainage to accommodate the new building was installed and connected to the existing building before excavation and pouring of ground beams, preparing for the laying of ground bearing slab. Brickwork was completed to match existing to DPC level and block work walls constructed as required following completion of the steel frame structure. The building was clad with profile sheeting and the internal completed to the architects specification. Levels around the new building were made good before external works to include lighting columns were completed.